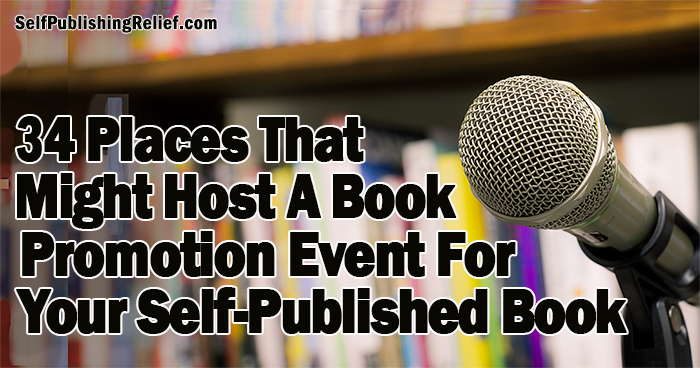 Looking for a new event location to promote your self-published book? Check out this great list of local and regional book promotion venues for self-published authors! Some of these book promotion locations are traditional (we’re looking at you, bookstores! ), but here at Self-Publishing Relief, we also see the potential in think-outside-the-box book promotion spots too. Event coordinators—from bookstore owners to the presidents of outdoors clubs—often get pitches from potential speakers and guests. To stand out from the crowd, it’s important to remember that there’s usually one thing on the event coordinator’s mind: What’s in it for my members/customers/me? If you ask for free promotion—but can’t really offer anything exciting in return—chances are your pitch (or plea) will be turned down. But if you can create a seminar, lecture, or event that has a great takeaway value, you might have audiences banging down your door! Use your existing connections and reach out to new people. When you visit in person to make your pitch, bring a promotional gift basket. Tempt organizers with the promise of a great promotional contest or other freebies. Mention cause marketing (giving proceeds back) to support the organization or cause. Follow up afterward with a nice thank-you note. Question: Where is the most unusual venue you’ve ever held a book promotion event?